Matt Crafton, driver of the No. 88 FVP/Menards Toyota Toyota, made his 16th career start at Las Vegas Motor Speedway (LVMS) in Saturday afternoon’s NASCAR Camping World Truck Series (NCWTS) DC Solar 350. Showing speed in both practice sessions on Saturday morning, the two-time champion backed up his time in qualifying Saturday afternoon, posting the second fastest time, in the unique single-truck, two Round qualifying session. Starting second in the second Chase race of Round 1, Crafton fought a Toyota Tundra that was, “snug through the center and off,” and lost ground to the leaders early in the 146-lap event. Crew chief Carl “Junior” Joiner brought the No. 88 machine to pit road, running 12th, under the races first caution at lap 39, for four tires, fuel and a major chassis adjustment. Unfortunately, Crafton would be forced to serve a pass through penalty, for an uncontrolled tire, and restarted from the 18th position at lap 43. Crafton, who reported he was, “making progress,” but still needed to be “freed-up off the corner,” worked his way up to the ninth position by lap 90, before “Junior” brought his Menards Toyota Tundra to pit road for a final round of adjustments at lap 93. Following a four tire, including a major air pressure adjustment and fuel pit stop, Crafton restarted from the 12th position at lap 98. In the ensuing 48 green-flag laps, the ThorSport Racing driver would gain four positions on the track as he searched for a preferred racing grove, but would settle for an eighth-place finish behind race winner, Tyler Reddick. The top-10 result was Crafton’s ninth top-10 finish at the 1.5-mile track. Crafton is now third in the 2016 NCWTS Chase with only one race remaining before the cut-off for Round 2, which includes the top-six drivers. • The NASCAR Camping World Truck Series (NCWTS) had two practice sessions on Saturday morning in preparation for Saturday’s DC Solar 350 at Las Vegas Motor Speedway (LVMS). Matt Crafton was second, and fourth, respectively, in both sessions. 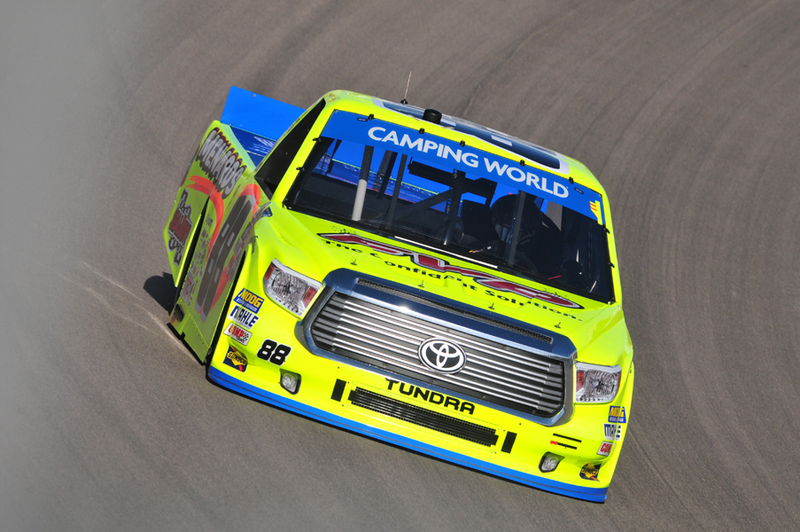 • Making his 16th NCWTS start at LVMS, Crafton started second, and finished eighth in the 146-lap event. • In 16 starts at LVMS, Crafton has one pole (2005) and has led the field for 136 laps en route to six top-five and nine top-10 finishes. • In 18 starts in 2016, Crafton has one pole (Atlanta), two wins, and has led 421 laps en route to six top-five, and 13 top-10 finishes. • In 379 career NCWTS starts, Crafton has earned 12 poles, led 2110 laps en route to 13 wins, 95 top-five and 223 top-10 finishes. • Crafton’s ThorSport Racing teammates finished 12th (Rhodes), 18th (Hayley), and 20th (Abreu). • Up Next: The fred’s 250 at Talladega Superspeedway on Saturday, October 22 at 1pm ET.